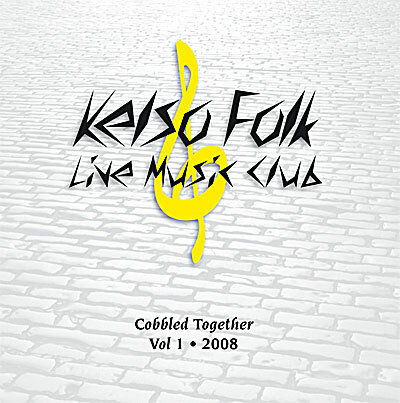 KELSO Folk and Live Music Club released its first CD album compilation – 21 tracks, 74 minutes, and involving at least 27 members – on Friday September 5th 2008. It’s a top quality ‘glass mastered’ commercial jewel cased CD, not to be confused with short run or home produce CD-Rs. Most of the recording production work was done by Peter Fry at his home studio near Yetholm, with members of the club visiting for recording sessions, overdubs and instrumental arrangements. Other members and guest artists have provided tracks directly or recorded their own for the project. Final mastering was done by David Kilpatrick, and the CD lists full artist and track names. The information has also been entered in the GraceNote Database, so if you copy ‘Cobbled Together Vol 1’ to your iPod, all the details will be automatically added on-line. We have a limited quantity of CDs remaining (as of February 2019) which can be purchased for £10 including postage and packing from Icon Publications Ltd (funds go to the club and a new CD currently in planning). Use the Paypal/card payment button to order here.